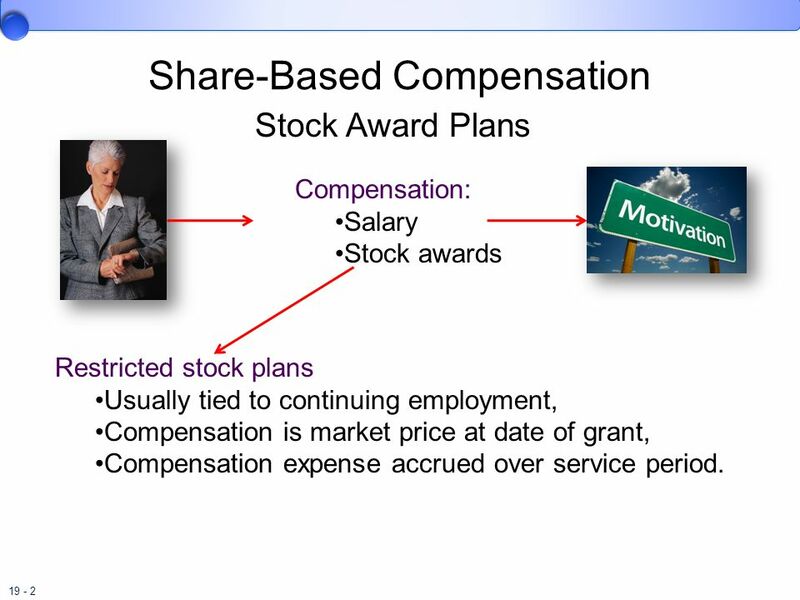 Stock Award Plans Compensation: Salary Stock awards Restricted stock plans Usually tied to continuing employment, Compensation is market price at date of grant, Compensation expense accrued over service period. Typically, an executive compensation plan is tied to performance in a strategy that uses compensation to motivate it recipients. 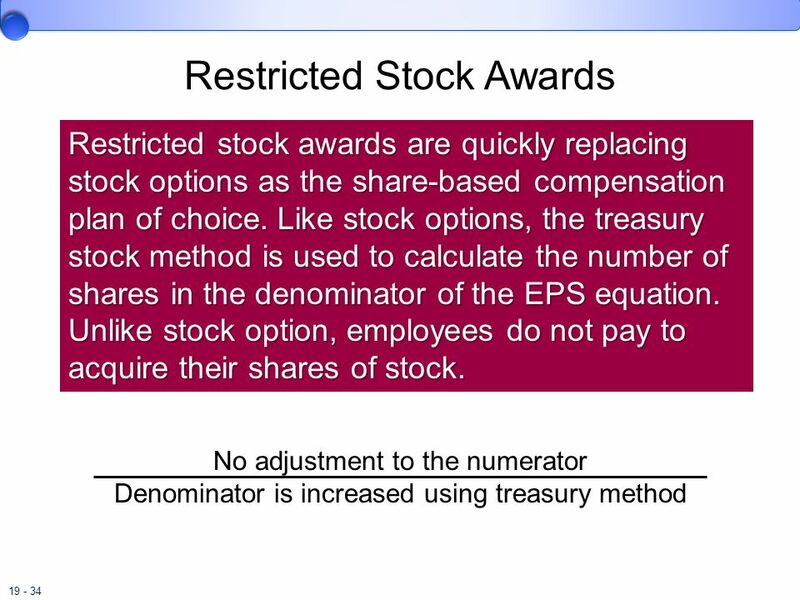 Restricted stock plans usually are tied to continued employment of the person receiving the award. The compensation associated with a share of restricted stock (or nonvested stock) is the market price at the grant date of an unrestricted share of the same stock. The amount is accrued as compensation expense over the service period for which participants receive the shares. 3 Stock Option Plans Stock option plans give employees the option to buy a specified number of shares of the firm's stock, at a specified exercise price, during a specified period of time. The fair value is accrued as compensation expense over the service period for which participants receive the options, usually from the date of grant to when the options become exercisable (the vesting date). 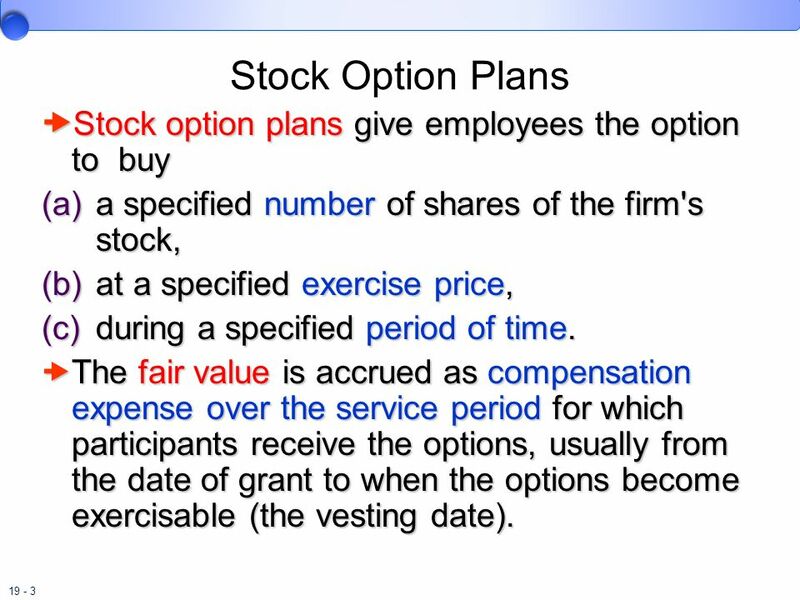 Stock option plans give employees the option to buy (a) a specified number of shares of the firm's stock, (b) at a specified exercise price, (c) during a specified period of time. The fair value is accrued as compensation expense over the service period for which participants receive the options, usually from the date of grant to when the options become exercisable (the vesting date). Historically, options have been measured at their intrinsic value – the simple difference between the market price of the shares and the option price at which they can be acquired. If the market and exercise price are equal on the date of grant, no compensation expense is recognized even if the options provide executives with substantial income. Historically, options have been measured at their intrinsic value. The intrinsic value is the simple difference between the market price of the shares and the option price at which they can be acquired. 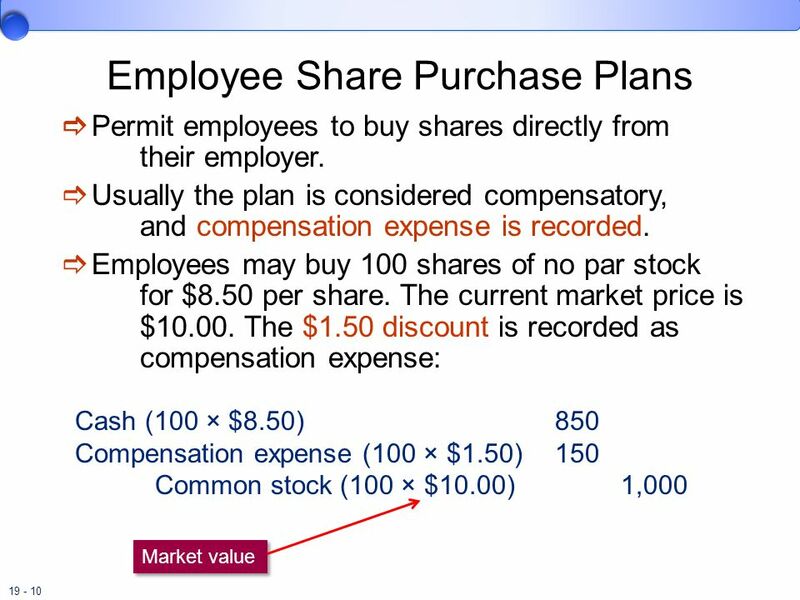 For example, an option that permits an employee to buy $25 stock for $10, has an intrinsic value of $15. However, plans in which the exercise price equals the market value of the underlying stock at the date of grant have no intrinsic value and therefore result in zero compensation when measured this way. This is true even if the executives received substantial income from the stock options. Opposition to a proposed FASB Statement to recognize expense for certain stock option plans have identified three objections. Options with no intrinsic value at issue have zero fair value and should not give rise to expense recognition. It is impossible to measure the fair value of compensation on the date of grant. Current practices have unacceptable economic consequences. The FASB proposed a new standard that would have required companies to measure options at their fair values at the time they are granted and to expense that amount over the appropriate service period. 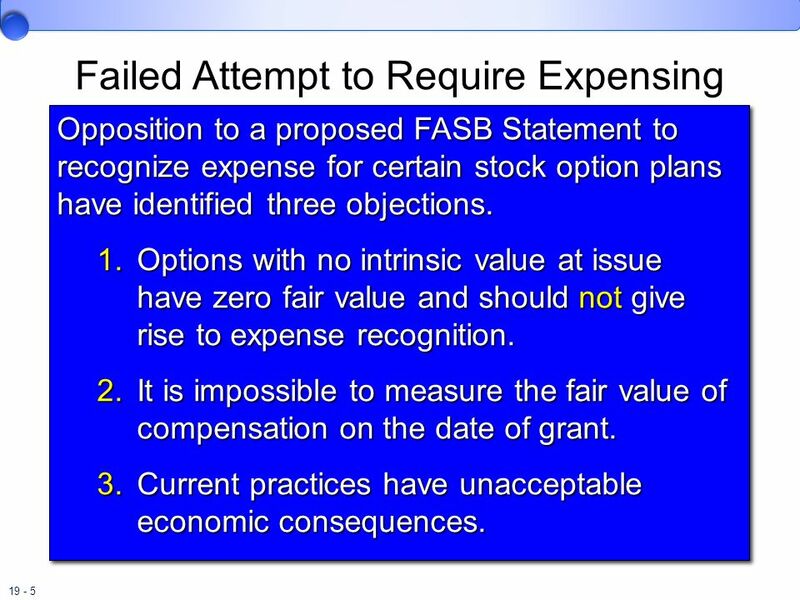 Opposition to a proposed FASB Statement for stock options identify three major objections. First, options with no intrinsic value at date of the issue have zero fair value and should not give rise to expense recognition. Second it is impossible to measure the fair value of the compensation expense at the date of grant. Third, the current accounting practices have unacceptable economic consequences. Accounting for stock options parallels the accounting for restricted stock we discussed earlier. We now are required to estimate the fair value of stock option on the grant date. 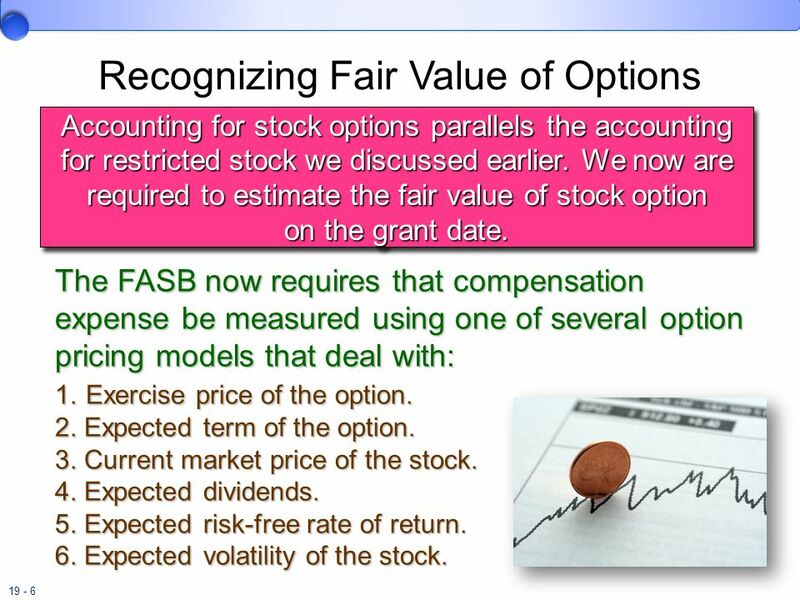 The FASB now requires that compensation expense be measured using one of several option pricing models that deal with: 1. Exercise price of the option. 2. Expected term of the option. 3. Current market price of the stock. 4. Expected dividends. 5. Expected risk-free rate of return. 6. Expected volatility of the stock. Effective for fiscal years beginning after June 5, 2005, companies now are required to estimate the fair value of stock options on the grant date. 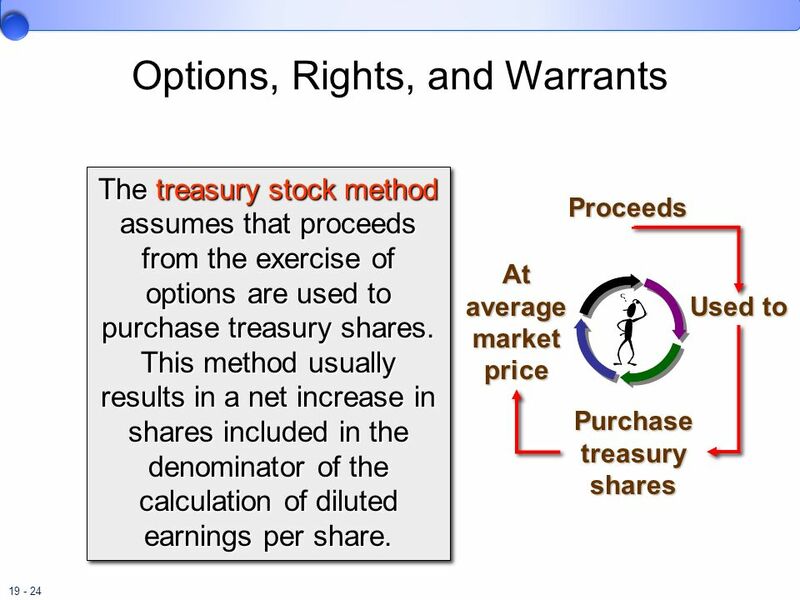 Accounting for stock options parallels the accounting for restricted stock we discussed earlier. We now are required to estimate the fair value of stock options on the grant date. 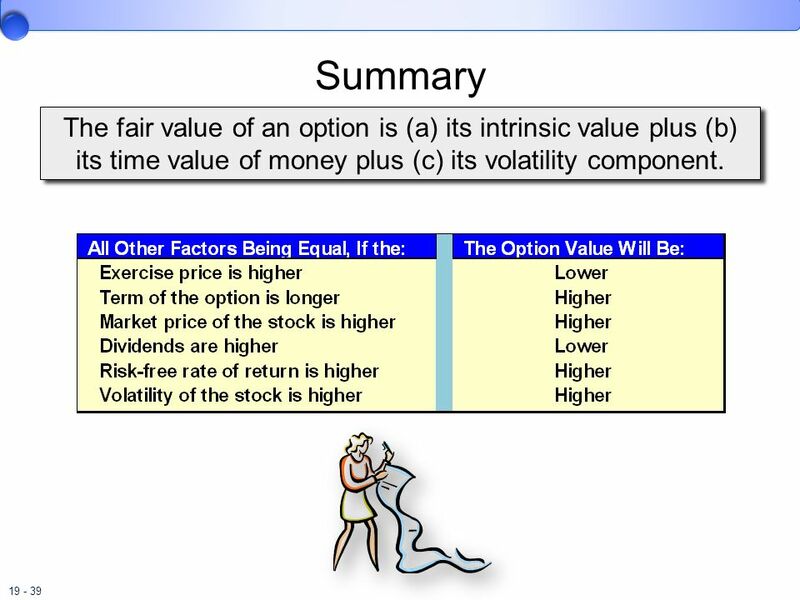 Most option pricing models consider the following variables when calculating price: Exercise price of the option. Expected term of the option. Current market price of the stock. Expected dividends. Expected risk-free rate of return. Expected volatility of the stock. The time between the date options are granted and the first date they can be exercised is the vesting period and usually is considered to be the service period over which the compensation expense is reported. 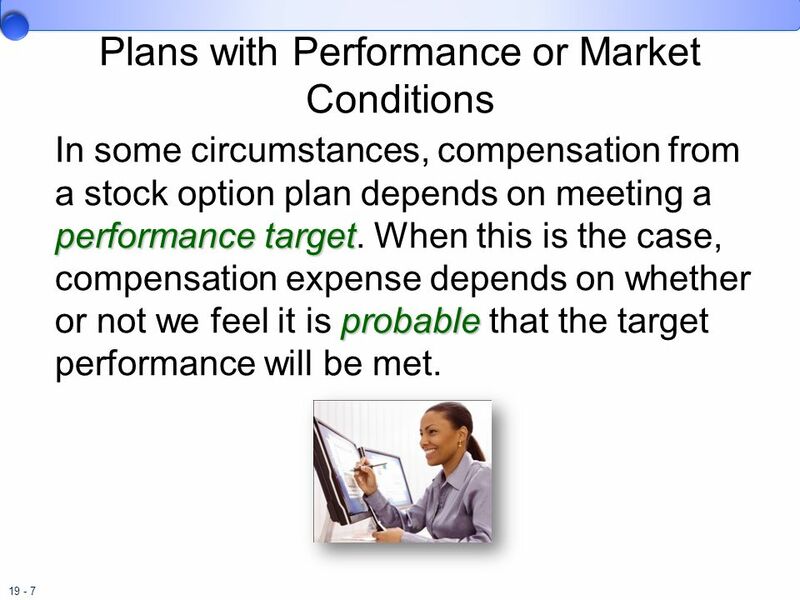 In some circumstances, compensation from a stock option plan depends on meeting a performance target. When this is the case, compensation expense depends on whether or not we feel it is probable that the target performance will be met. Some stock option plans are structured so that compensation is received only when certain performance or market conditions are met. For example, the options may be exercised only if earnings per share exceed $2. If it is not probable that the condition will be met, no compensation is recognized. If it is probable that the condition will be meet compensation must be recognized. In some cases this means that we will have a cumulative amount of compensation to recognize. That is compensation for the current period plus an adjustment for the periods when we did not recognize compensation. Let’s use are previous stock option plan from Matrix and add a performance condition. 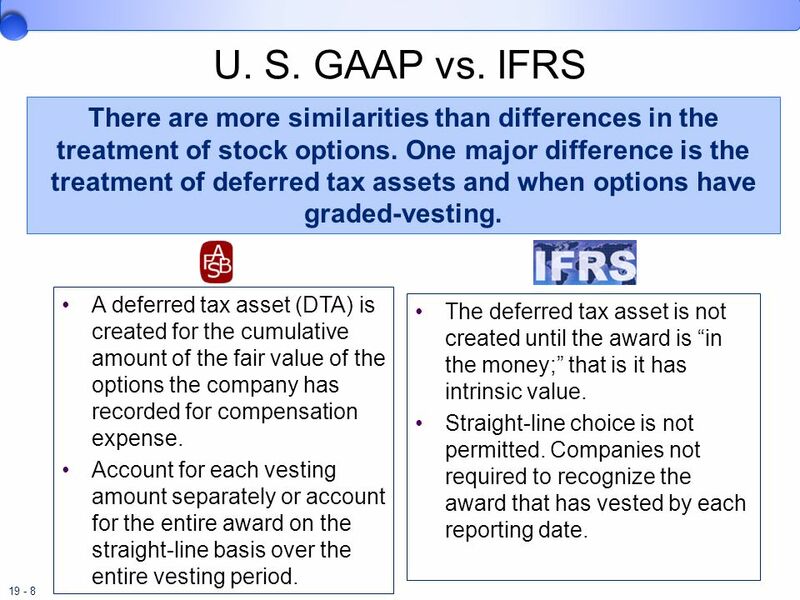 8 U. S. GAAP vs. IFRS There are more similarities than differences in the treatment of stock options. One major difference is the treatment of deferred tax assets and when options have graded-vesting. A deferred tax asset (DTA) is created for the cumulative amount of the fair value of the options the company has recorded for compensation expense. Account for each vesting amount separately or account for the entire award on the straight-line basis over the entire vesting period. The deferred tax asset is not created until the award is “in the money;” that is it has intrinsic value. Straight-line choice is not permitted. Companies not required to recognize the award that has vested by each reporting date. Part I There are more similarities than in the treatment of stock options. One major difference is the treatment of deferred tax assets and when options have graded-vesting. Part II From the viewpoint of the FASB; A deferred tax asset (DTA) is created for the cumulative amount of the fair value of the options the company has recorded for compensation expense. Account for each vesting amount separately or account for the entire award on the straight-line basis over the entire vesting period. From the viewpoint of the IFRS; The deferred tax asset is not created until the award is “in the money;” that is it has intrinsic value. Straight-line choice is not permitted. Companies not required to recognize the award that has vested by each reporting date. Rather than stock option plans vesting on a single date, more plans awards specify that recipients gradually become eligible to exercise their options rather than all at once. 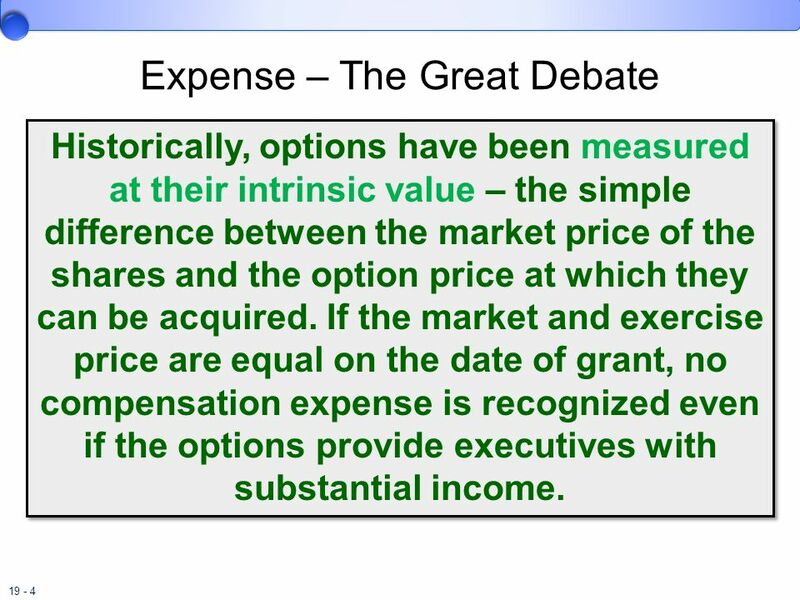 This is called “graded vesting.” Accounting for compensation expense may be handled: 1 The company may estimate a single fair value for each of the options, even though they vest over different time periods, using a single weighted-average expected life of the options. 2 The company may use a slightly more complex method because it usually results in lower expense. In this approach, we view each vesting group separately, as if it were a separate award. For example, a company may award stock options that vest 25% in the first year, 25% in second year, and 50% the third years. For accounting purposes we have three separate awards. Rather than stock option plans vesting on a single date, more plans awards specify that recipients gradually become eligible to exercise their options rather than all at once. 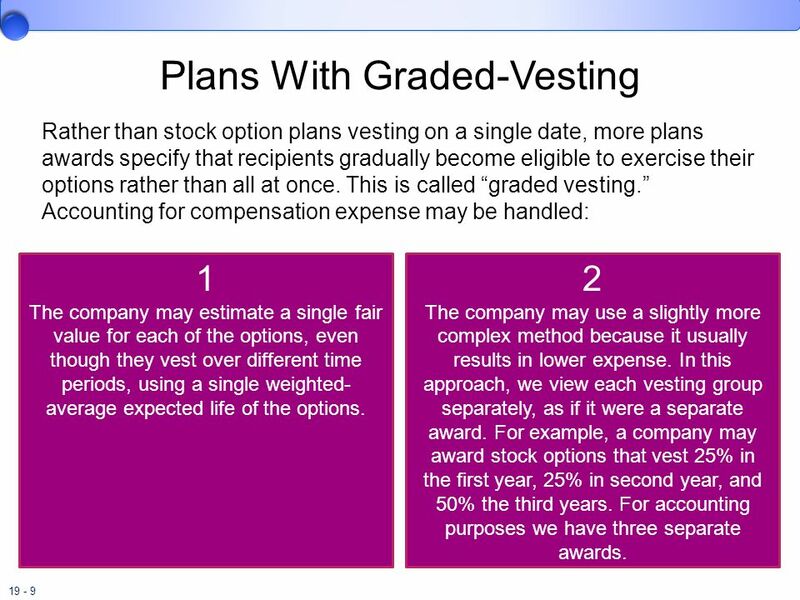 This is called “graded vesting.” Accounting for compensation expense may be handled: The company may estimate a single fair value for each of the options, even though they vest over different time periods, using a single weighted-average expected life of the options. The company may use a slightly more complex method because it usually results in lower expense. In this approach, we view each vesting group separately, as if it were a separate award. For example, a company may award stock options that vest 25% in the first year, 25% in second year, and 50% the third years. For accounting purposes we have three separate awards. 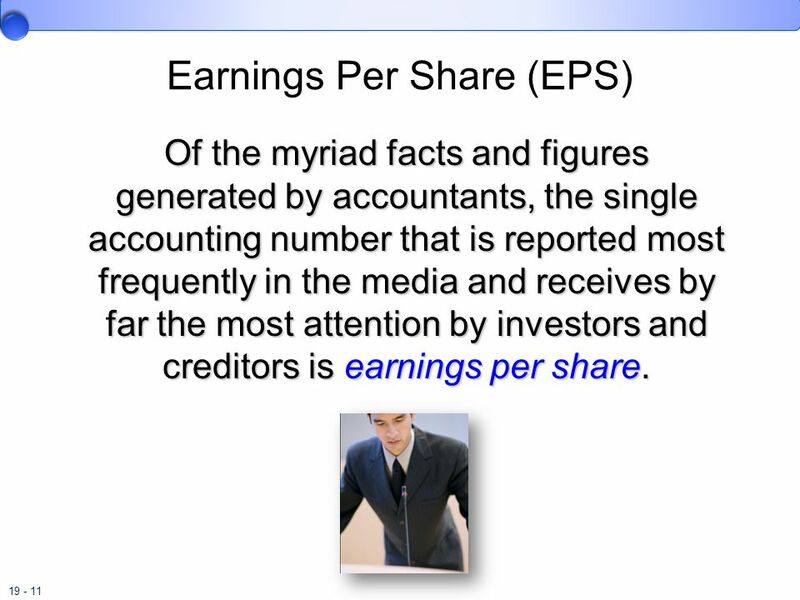 Of the myriad facts and figures generated by accountants, the single accounting number that is reported most frequently in the media and receives by far the most attention by investors and creditors is earnings per share. A typical corporate annual report contains four comparative financial statements, an extensive list of disclosure notes and schedules, and several pages of charts, tables, and textual descriptions. Of the myriad facts and figures generated by accountants, the single accounting number that is reported most frequently in the media and receives by far the most attention by investors and creditors is earnings per share. Because earnings per share is such a widely quoted number, the accounting profession has promulgated many rules devised to achieve consistency when reporting EPS. 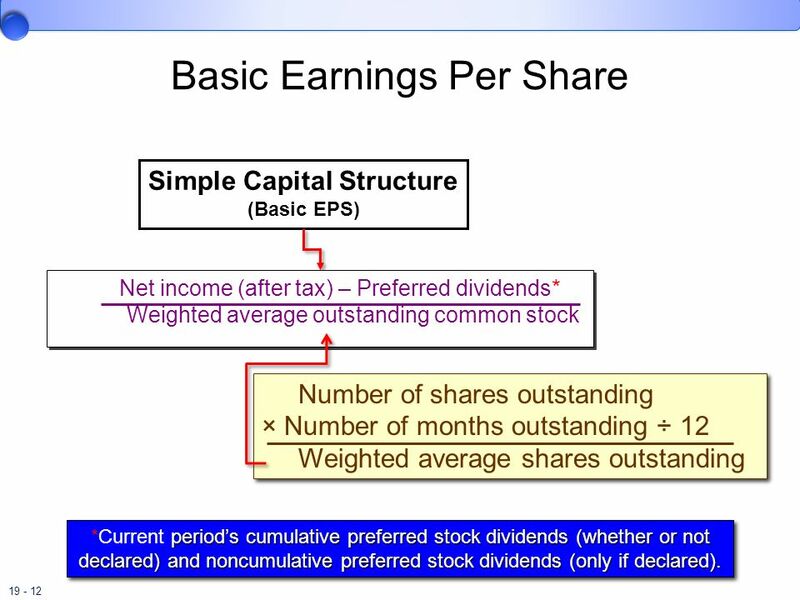 Simple Capital Structure (Basic EPS) Net income (after tax) – Preferred dividends* Weighted average outstanding common stock Number of shares outstanding × Number of months outstanding ÷ Weighted average shares outstanding A simple capital structure requires that we disclose only basic earnings per share. Basic earnings per share is to defined as net income after taxes, minus certain preferred dividends, divided by the weighted average number of common shares outstanding. Current period’s cumulative preferred stock dividends will be subtracted, whether declared or not. 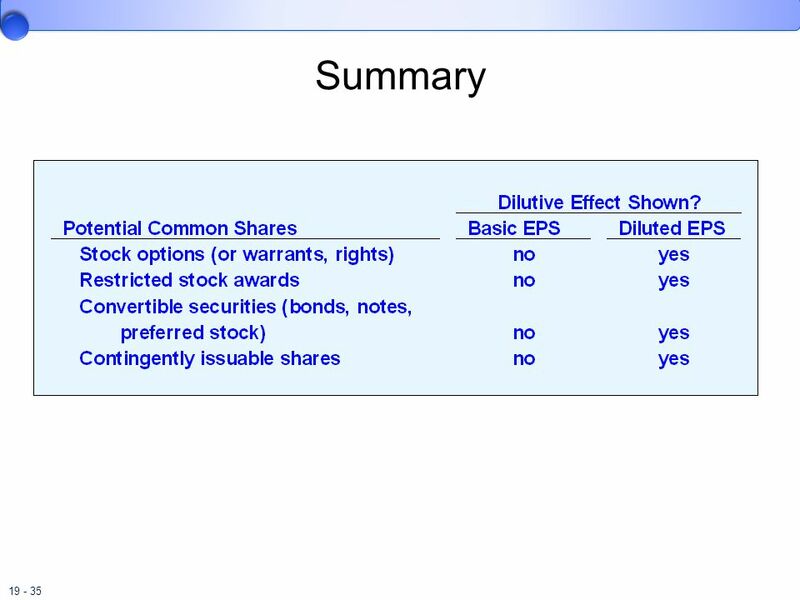 Noncumulative preferred stock dividends will only be subtracted if they have been declared. The weighted average number of common shares outstanding is determined by taking the number of shares outstanding times the number of months that those shares have been outstanding, divided by 12. *Current period’s cumulative preferred stock dividends (whether or not declared) and noncumulative preferred stock dividends (only if declared). 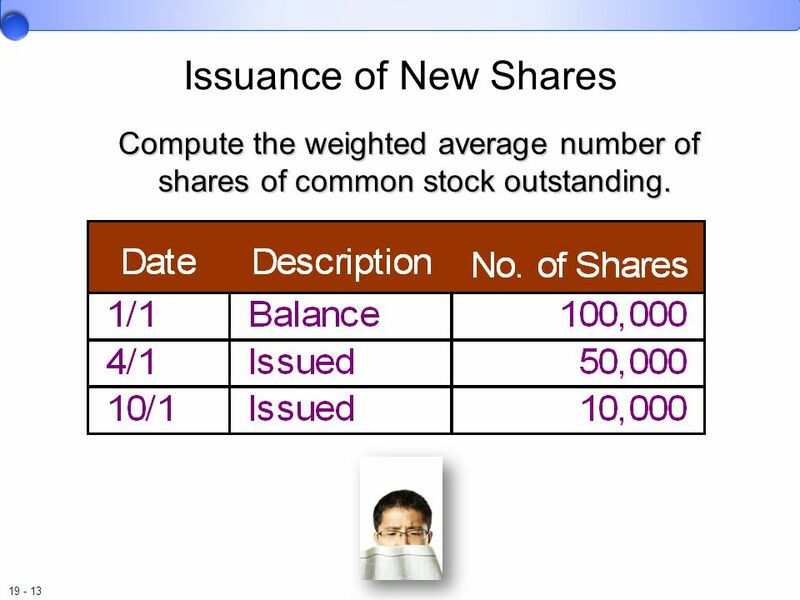 13 Issuance of New Shares Compute the weighted average number of shares of common stock outstanding. Here is as simple example that we will use to calculate weighted average number of common shares outstanding. The company has the beginning balance of 100,000 shares outstanding, and they issued additional shares of common stock two times during the year. See if you can calculate the weighted average common shares outstanding before you move on to the next slide. 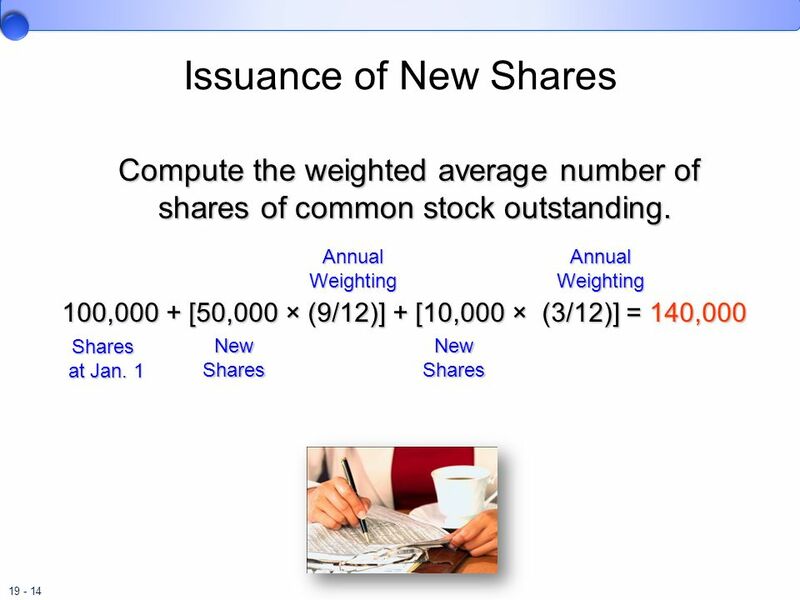 14 Issuance of New Shares Compute the weighted average number of shares of common stock outstanding. Annual Weighting Annual Weighting 100,000 + [50,000 × (9/12)] + [10,000 × (3/12)] = 140,000 Shares at Jan. 1 New Shares New Shares The beginning balance of shares has been outstanding all year, so we weight the hundred thousand shares times, 12 twelfths. The first issue of common shares, took place on April 1st. The 50,000 shares have been outstanding 9 twelfths of the year. The last issue of common stock took place on October 1. The shares have been outstanding for 3 twelfths of the year. Finally we sum the weighted shares to get a total weighted average common shares outstanding for the year of 140,000. 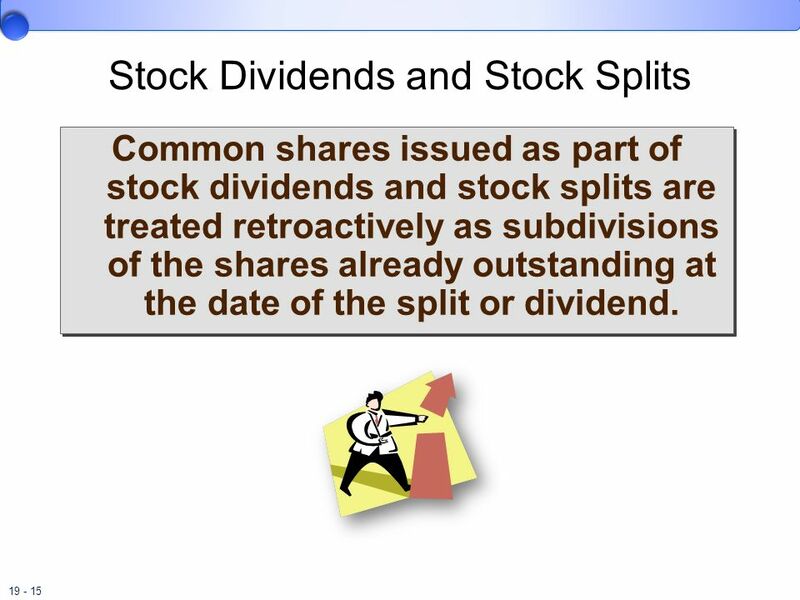 Common shares issued as part of stock dividends and stock splits are treated retroactively as subdivisions of the shares already outstanding at the date of the split or dividend. Recall that a stock dividend or a stock split is a distribution of additional shares to existing shareholders. There is an important difference between the increase in shares caused by a stock dividend and an increase from selling new shares. When new shares are sold, both assets and shareholders’ equity are increased. 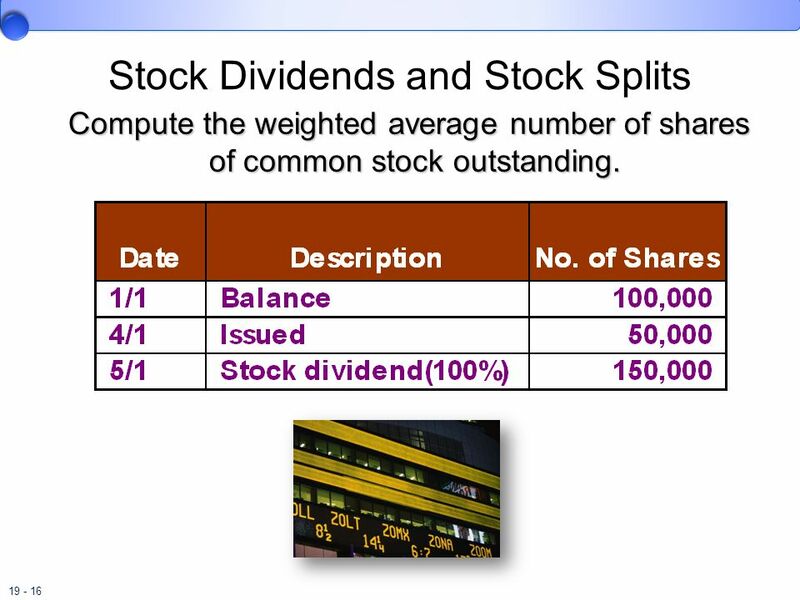 For a stock dividend or split there is merely an increase in the number of shares outstanding. Common shares that are issued as part of a stock dividend or stock split are treated retroactively. They may be viewed as subdivisions of the shares already outstanding at the date of the split or dividend. Compute the weighted average number of shares of common stock outstanding. This example shows you how to handle stock dividends. 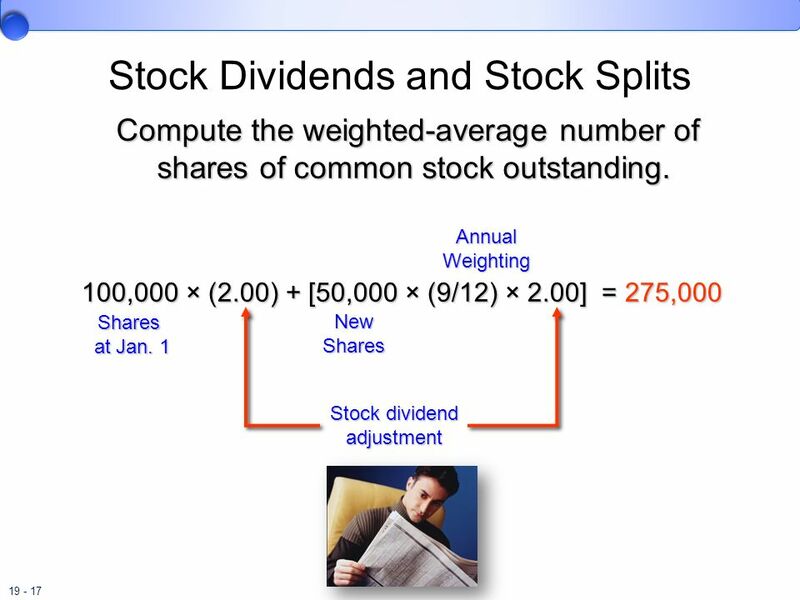 Stock splits enter the calculation of weighted-average shares outstanding in the same manner as stock dividends. Notice that on May 1, the company issued a 100% stock dividend. Let’s see how we would calculate weighted average common shares outstanding, given this new fact. Retroactive treatment: New shares issued this period? 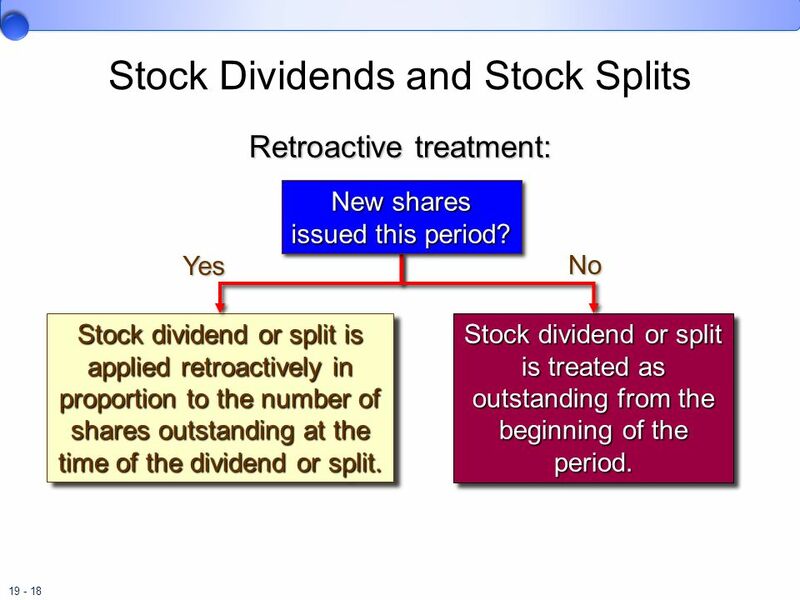 Yes No Stock dividend or split is applied retroactively in proportion to the number of shares outstanding at the time of the dividend or split. Stock dividend or split is treated as outstanding from the beginning of the period. If we issue shares during the period, in the form of a stock dividend or stock split, we treat those shares retroactively for the portion of the year that the original shares were outstanding. If the stock split had been issued prior to the current year, we would adjust the weighted-average common shares outstanding, as if the split had taken place at the beginning of the year. 19 Reacquired Shares If shares were reacquired during the period, the weighted-average number of shares is reduced. The number of reacquired shares is time-weighted for the fraction of the year they were not outstanding. 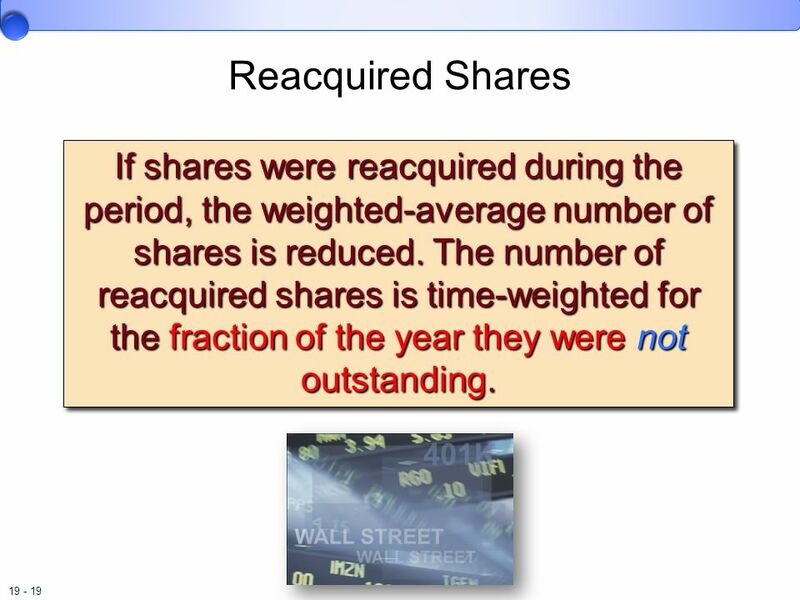 If shares were reacquired during the period, the weighted-average number of shares is reduced. The number of reacquired shares is time-weighted for the fraction of the year they were not outstanding. 20 Reacquired Shares Compute the weighted-average number of shares of common stock outstanding. Once again, we have expanded our original example. In this example, the company repurchased 12,000 of its own common shares. Let’s see how we will treat these repurchased shares. 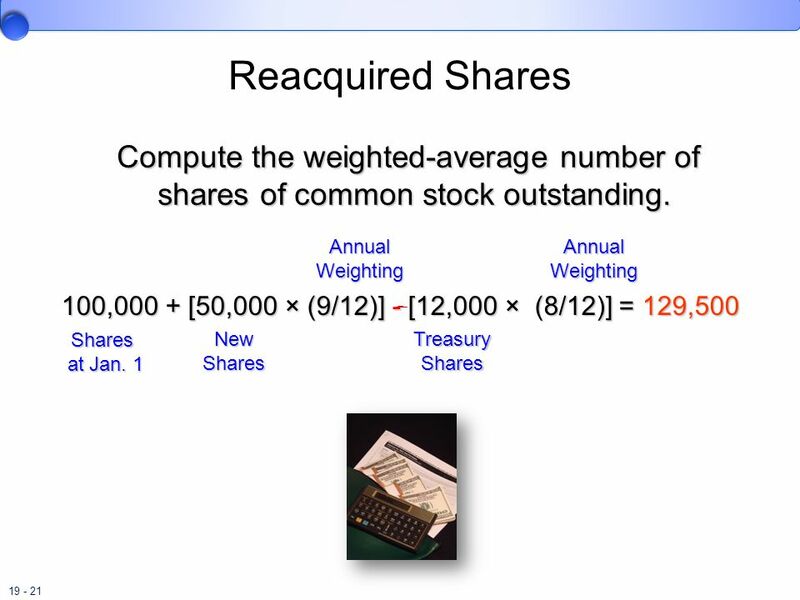 21 Reacquired Shares Compute the weighted-average number of shares of common stock outstanding. Annual Weighting Annual Weighting 100,000 + [50,000 × (9/12)] - [12,000 × (8/12)] = 129,500 ˗̶ Shares at Jan. 1 New Shares Treasury Shares You can see that the weighting of the original 100,000 shares for the entire year, and the 50,000 shares issued on April the first are weighted for nine 12th of the year. The reacquired shares are not outstanding from May 1 through December 31 or eight months, so they are weighted as a negative amount for eight 12th of the year. In this example we have 129,500 weighted-average common shares outstanding. Net income Less: Current period’s cumulative preferred stock dividends (whether or not declared) Less: Noncumulative preferred stock dividends (only if declared) Net income available to common shareholders As we have discussed before, the numerator of the earnings per share equation is equal to net income less dividends on cumulative preferred stock, less dividends on noncumulative preferred stock, only if they have been declared. Net income minus preferred dividends is referred to as net income available to common shareholders. 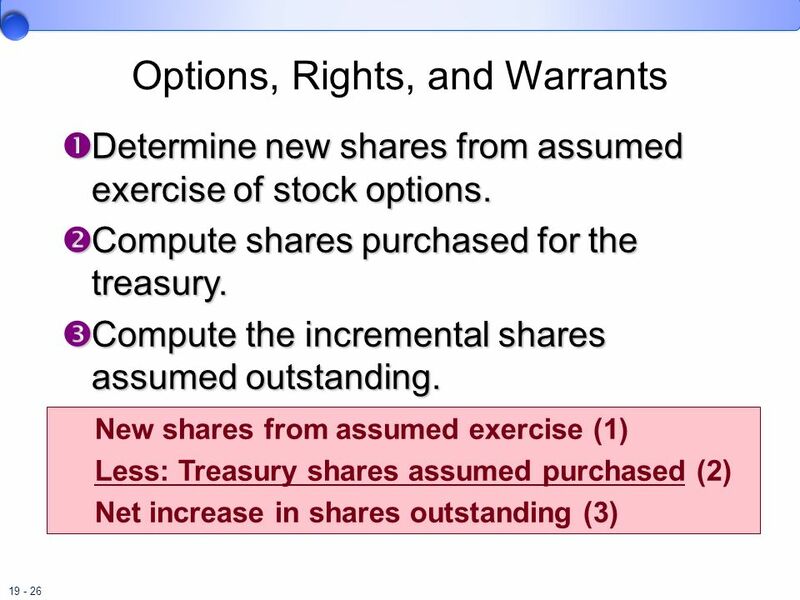 Determine new shares from assumed exercise of stock options. 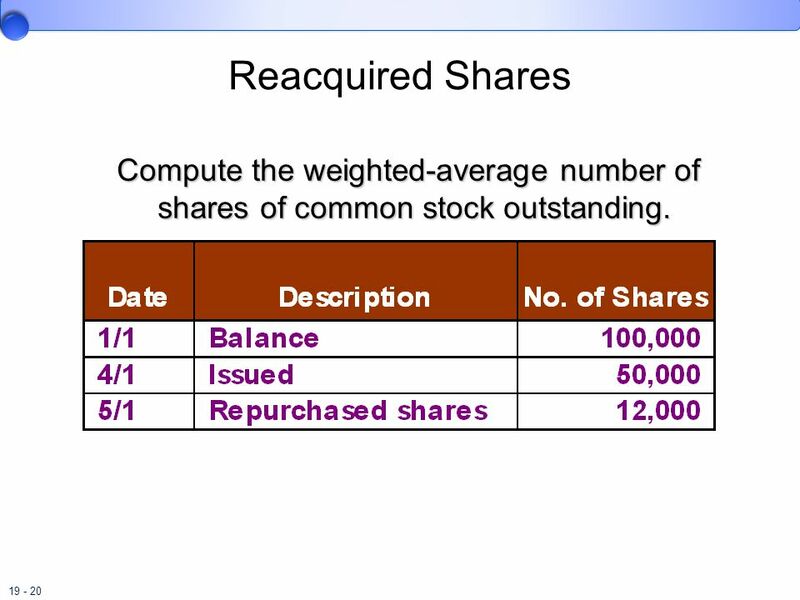 Compute number of shares repurchased. 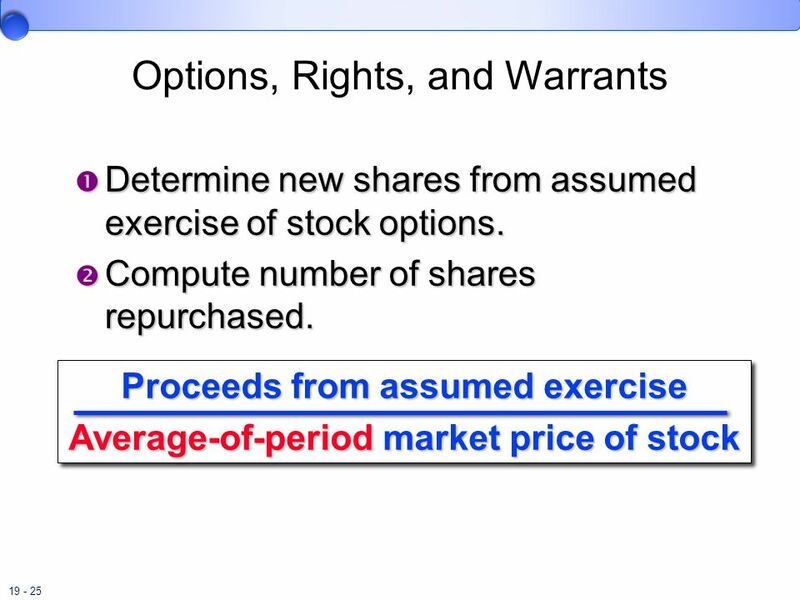 Proceeds from assumed exercise Average-of-period market price of stock First we determined the new shares from the assumed conversion of the stock options, rights, or warrants. Then we compute the shares purchased using the proceeds received to purchase shares of treasury stock at the average-of-period market price of the stock. When the exercise price exceeds the market price, the securities are antidilutive and are excluded from the calculation of diluted EPS. 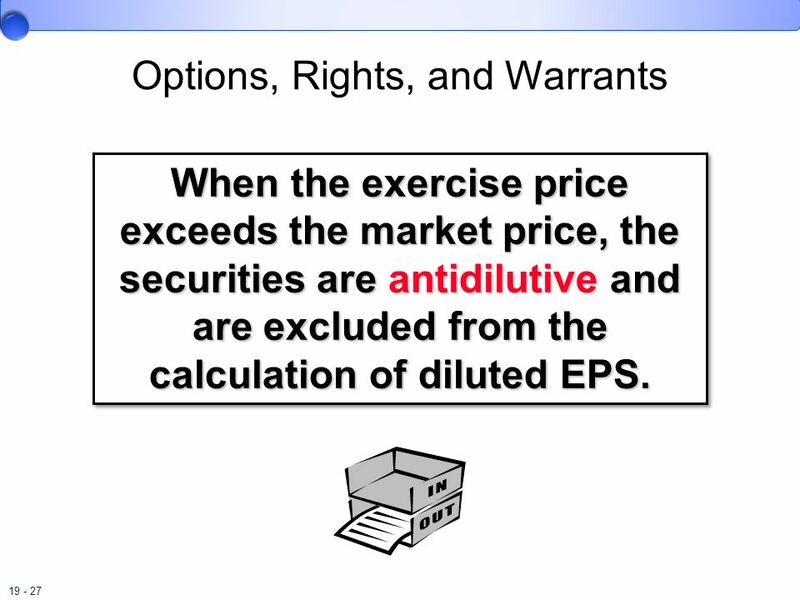 If the exercise price of the option, right, or warrant is higher than the market price, the securities are said to be antidilutive, and are excluded from the calculation of diluted earnings per share. The if-converted method is used for Convertible debt and equity securities. The method assumes conversion occurs as of the beginning of the period or date of issuance, if later. Sometimes corporations include a conversion feature as part of a bond offering, a note payable, or an issue of preferred stock. Convertible securities can be converted into shares of stock at the option of the holder of the security. For that reason, convertible securities are potentially dilutive. EPS will be affected if and when such securities are converted and new shares of common stock are issued. When a company has convertible securities and is calculating earnings per share, it uses the “if converted” method to determine the impact of those securities upon earnings per share. 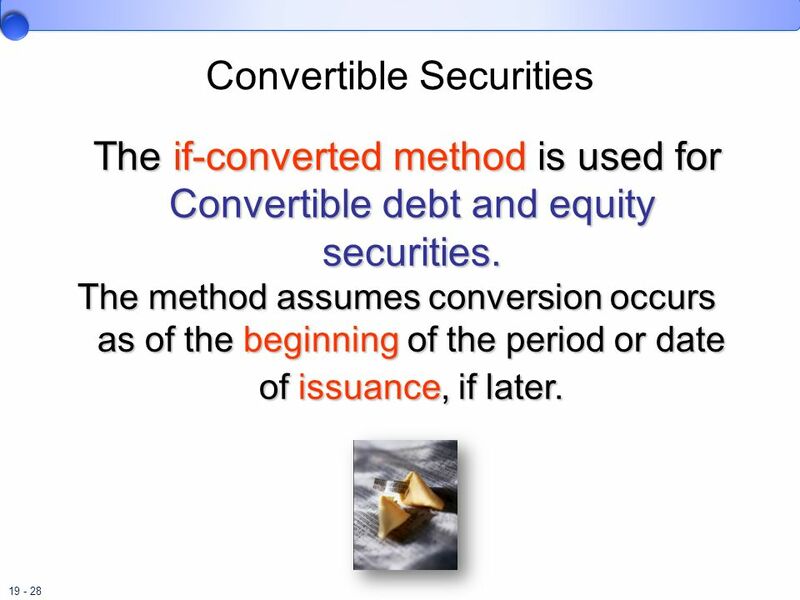 The “if converted” method assumes the conversion into common stock occurred at the beginning of the period (or at the time the convertible security is issued, if that is later). If the convertible shares have been outstanding in prior years, we will assume conversion as of the beginning of the current period. 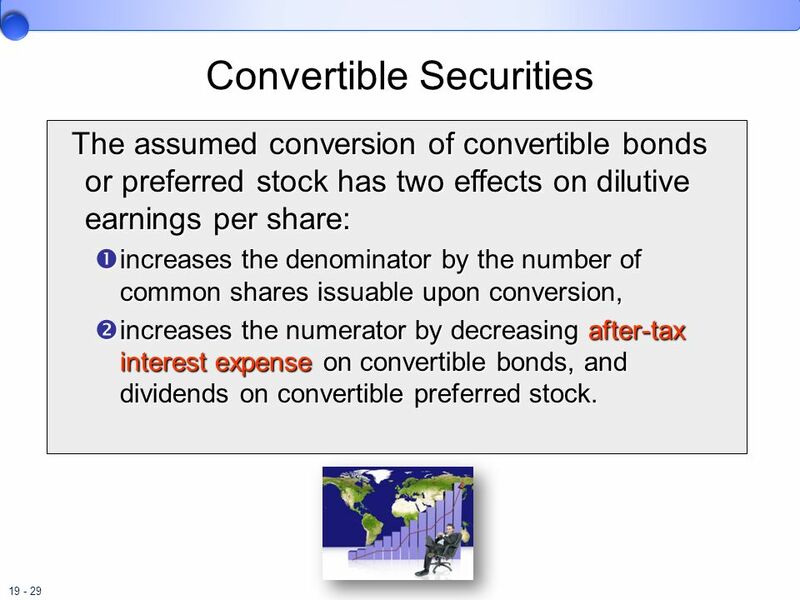 The assumed conversion of convertible bonds or preferred stock has two effects on dilutive earnings per share: increases the denominator by the number of common shares issuable upon conversion, increases the numerator by decreasing after-tax interest expense on convertible bonds, and dividends on convertible preferred stock. If the company has convertible securities, there is an impact on both the numerator and denominator of the equation. First, we increase the denominator of the EPS fraction by the additional common shares that would have been issued upon conversion. Next, we increase the numerator by the interest (after tax) on bonds and other debt or preferred dividends that would have been avoided if the convertible securities had not been outstanding due to having been converted. Dilutive earnings per share may decrease or increase after the assumed conversion. 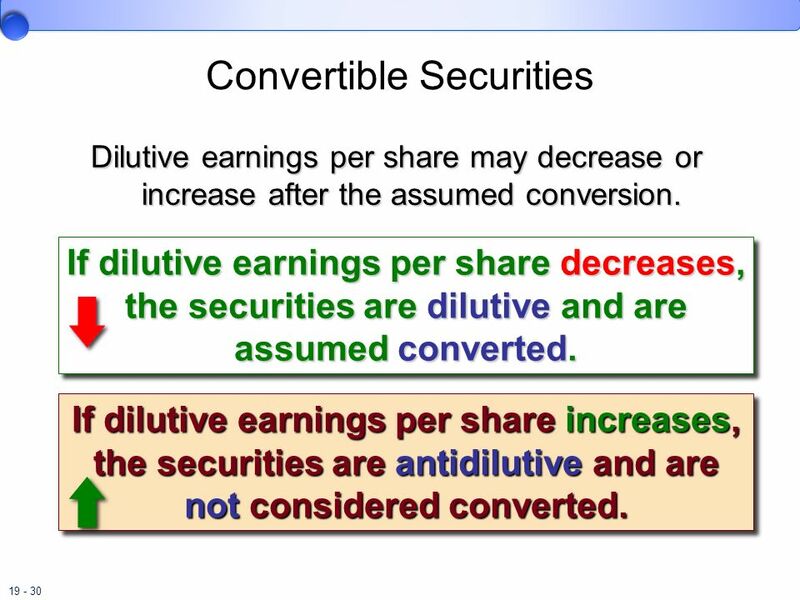 If dilutive earnings per share decreases, the securities are dilutive and are assumed converted. Dilutive earnings per share may increase or decrease as a result of the assumed conversion. 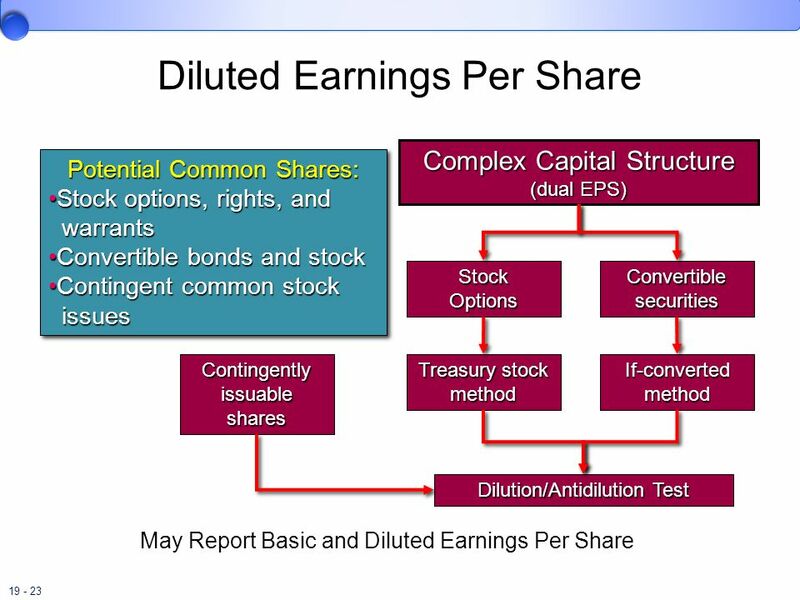 If diluted earnings per share decreases, the securities are in fact dilutive and are assumed converted. If the diluted earnings per share increases, the securities are antidilutive and are not considered in the calculation of diluted earnings per share. If dilutive earnings per share increases, the securities are antidilutive and are not considered converted. 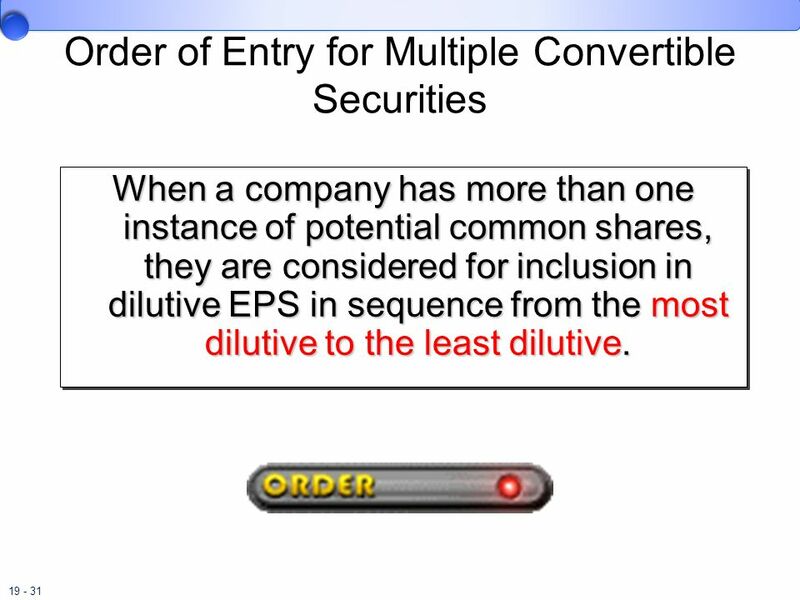 When a company has more than one instance of potential common shares, they are considered for inclusion in dilutive EPS in sequence from the most dilutive to the least dilutive. A convertible security might seem to be dilutive when looked at individually but, in fact, may be antidilutive when included in combination with other convertible securities. This is because the order of entry for including their effects on the EPD calculation determined by how much, or even whether, EPS decreases as a result of their assumed conversion. When a company has more than one potentially dilutive security, they are considered for inclusion in diluted earnings per share, starting with the most dilutive and working to the least dilutive. Additional EPS Issues Contingently Issuable Shares Contingent shares are issuable in the future for little or no cash consideration upon the satisfaction of certain conditions. Contingently issuable shares are considered to be outstanding in the computation of EPS if the target performance level already is being met. Sometimes an agreement specifies that additional shares of common stock will be issued contingent on the occurrence of some future event. At times, contingent shares are issuable to certain key executives, or others in the event of a certain level of performance is achieved. The performance may be related to a desired level of income, a target stock price, or some other measurable activity level. Contingently issuable shares are offered for little or no cash, upon the satisfaction of some specified condition. 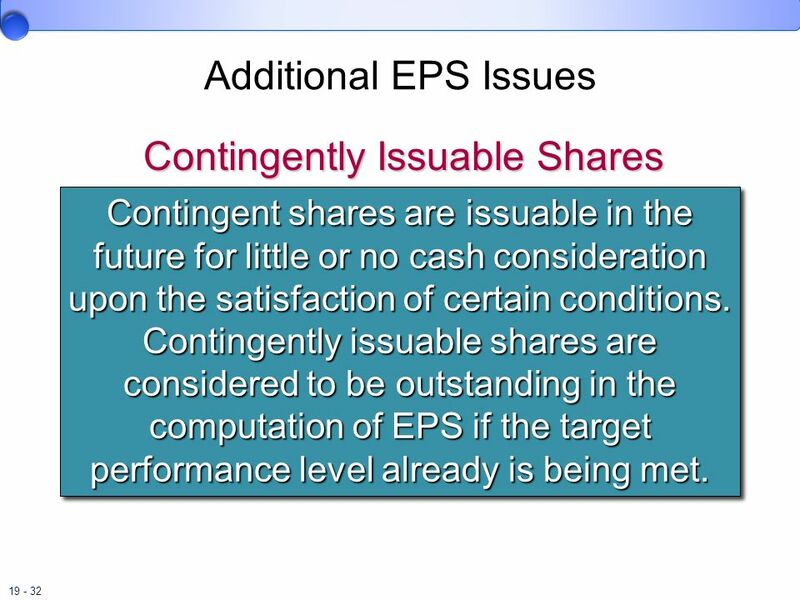 Contingently issuable shares are considered to be outstanding in the computation of EPS if the target performance level already is being met. Contingent shares are included in dilutive EPS if: Shares are issued merely due to passage of time. Some target performance level has already been met and is expected to continue to the end of the contingency period. 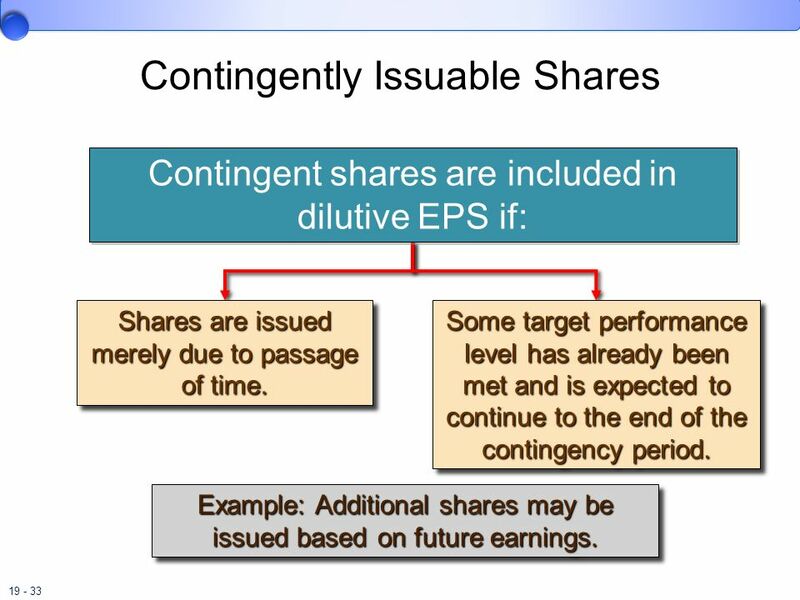 Contingently issuable shares are included in diluted earnings per share, if they are issuable merely due to the passage of time, or if they’re based upon some target performance level and that target performance level has already been met. Perhaps the most common example of contingently issuable shares is shares that are issued upon reaching some future earnings level. Example: Additional shares may be issued based on future earnings. 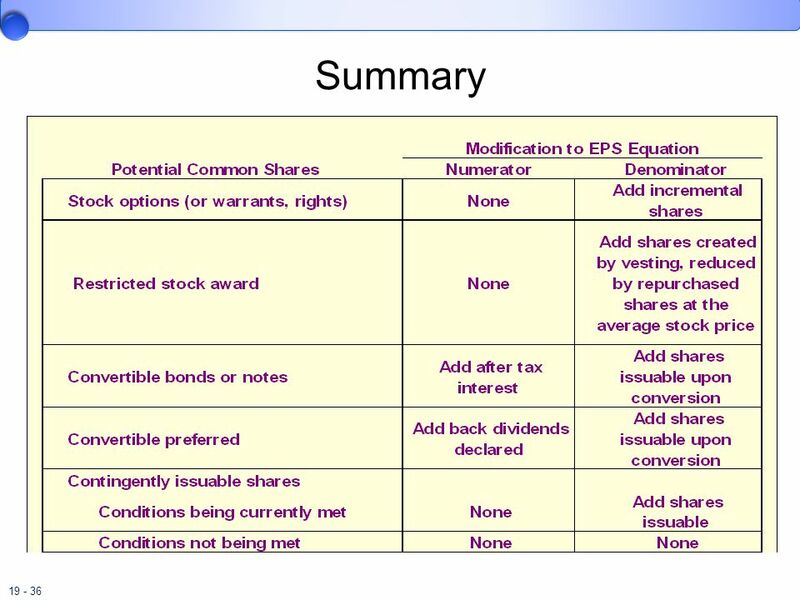 35 Summary Here is a short summary of the treatment of stock options, convertible securities, and contingently issuable shares on basic and diluted earnings per share. 36 Summary This is a more detailed summary of the impact of the options, convertible bonds, convertible preferred and contingently issuable shares on the numerator and denominator of the earnings per share equation. 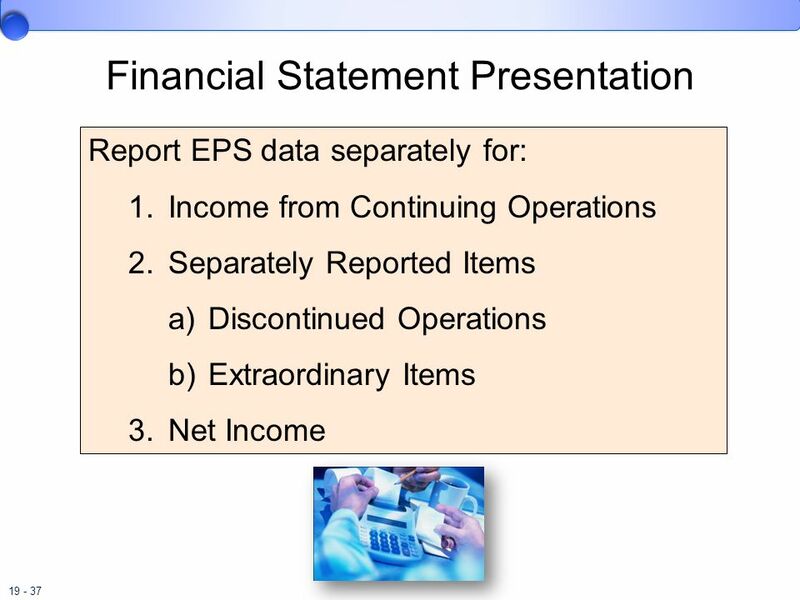 Report EPS data separately for: Income from Continuing Operations Separately Reported Items Discontinued Operations Extraordinary Items Net Income Companies must disclose per share amounts for (1) income before any separately reported items, (2) each separately reported item, and (3) net income. Intrinsic value is the benefit the holder of an option would realize by exercising the option rather than buying the underlying stock directly. An option that permits an employee to buy $25 stock for $10, has an intrinsic value of $15. Options have a time value because the holder of an option does not have to pay the exercise price until the option is exercised. Intrinsic value is the benefit a holder of an option would realize by exercising the option rather than buying the underlying stock directly. An option that permits an employee to buy $25 stock for $10, has an intrinsic value of $15. 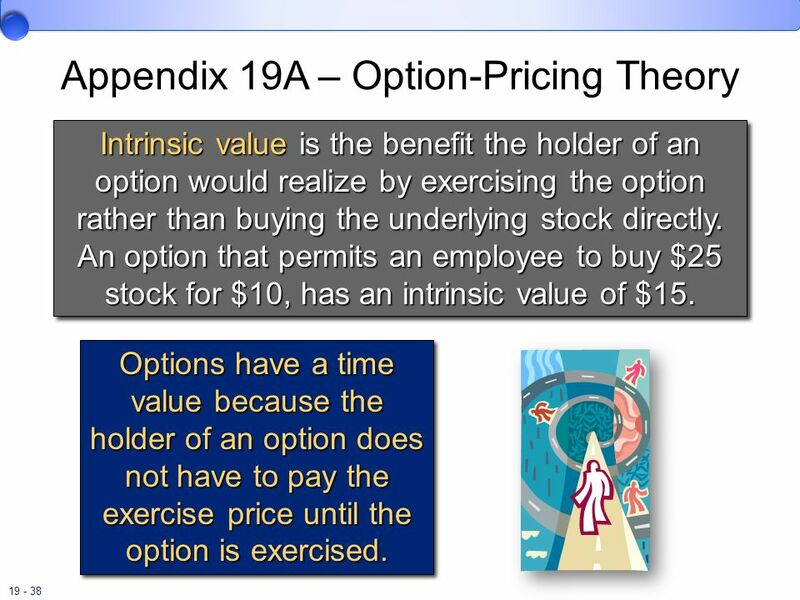 Options have a time value because the holder of the option does not have to pay the exercise price until the option is exercised. 39 Summary The fair value of an option is (a) its intrinsic value plus (b) its time value of money plus (c) its volatility component. The fair value of an option is its intrinsic value, plus it’s time value of money, plus its volatility component. This table shows the impact of various option pricing factors on the value of the option itself. 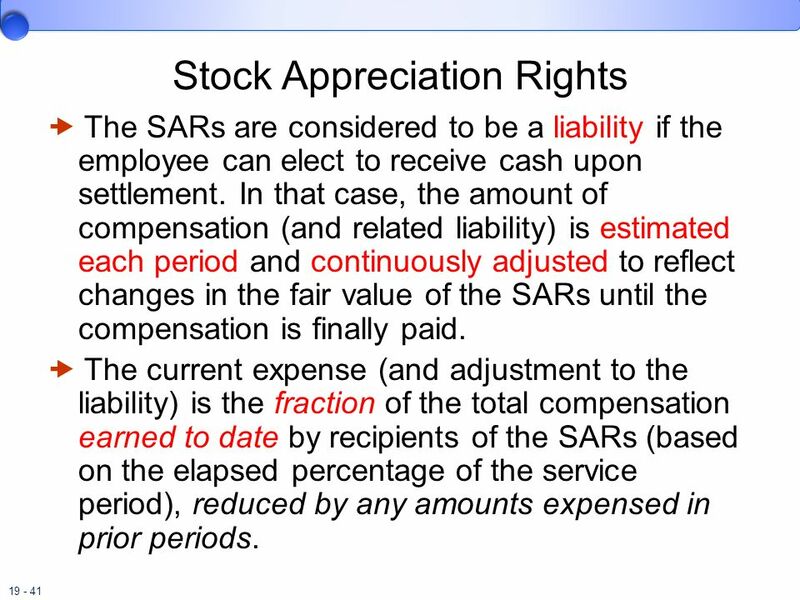  The SARs are considered to be equity if the employer can elect to settle in shares of stock.  The amount of compensation is estimated at the grant date as the fair value of the SARs.  This amount is expensed over the service period. Usually the same as the fair value of a stock option with similar terms. 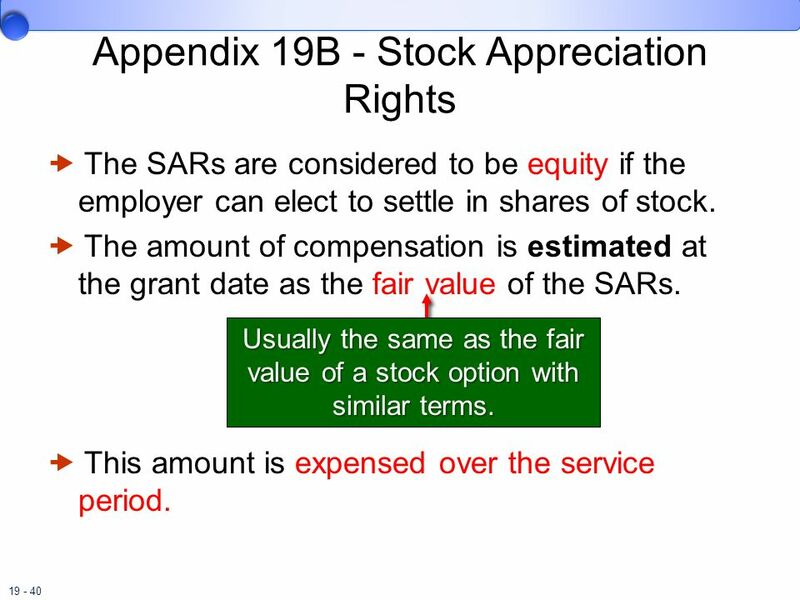 Stock appreciation rights, or SARs, are consider equity if the employer can elect to settle the rights in shares of the company’s stock. The amount of compensation expense is estimated at the date of grant as the fair market value of the SARs. The estimated amount is expensed over the service period.  The SARs are considered to be a liability if the employee can elect to receive cash upon settlement. In that case, the amount of compensation (and related liability) is estimated each period and continuously adjusted to reflect changes in the fair value of the SARs until the compensation is finally paid.  The current expense (and adjustment to the liability) is the fraction of the total compensation earned to date by recipients of the SARs (based on the elapsed percentage of the service period), reduced by any amounts expensed in prior periods. In some cases, the employee may elect to receive cash upon settlement of the SARs plan. In this case the SARs represent a liability. The amount of compensation expense is estimated each accounting period and continuously updated to reflect changes in the fair vale of the SARs. The current compensation expense is a fraction of the total compensation earned to date by the recipients of the SARs reduced by the amounts expensed in pervious periods. 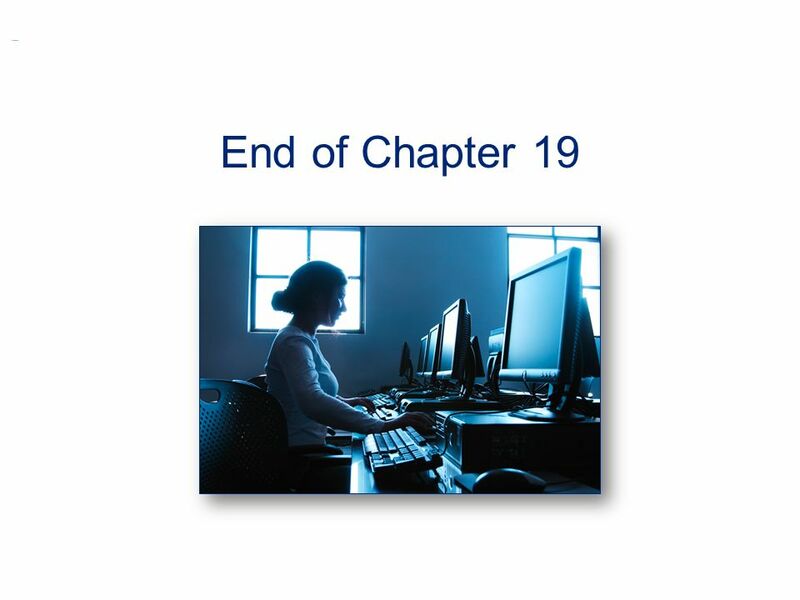 42 End of Chapter 19 End of Chapter 19. Download ppt "Share-Based Compensation and Earnings Per Share"
Chapter Six Variable Interest Entities, Intra-Entity Debt, Consolidated Cash Flows, and Other Issues McGraw-Hill/Irwin Copyright © 2013 by The McGraw-Hill. 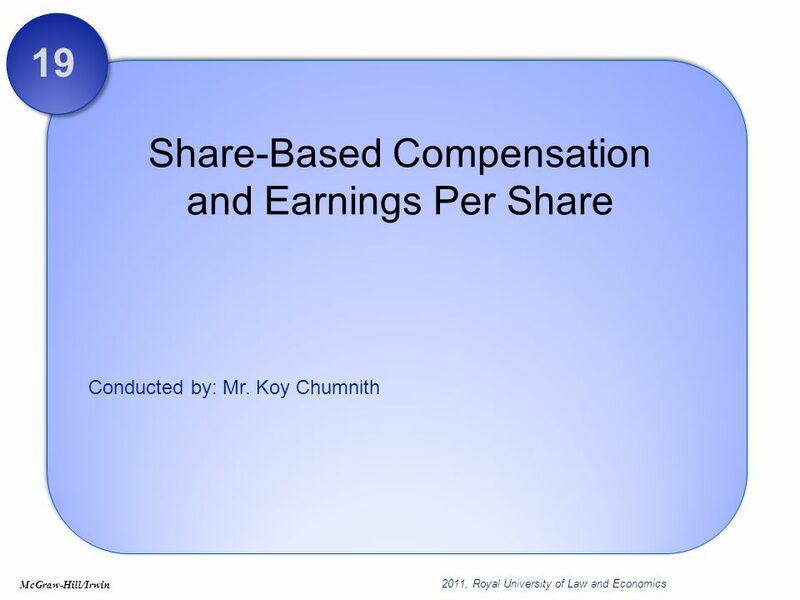 Earnings Per Share (EPS) RCJ Chapter 15 ( ). 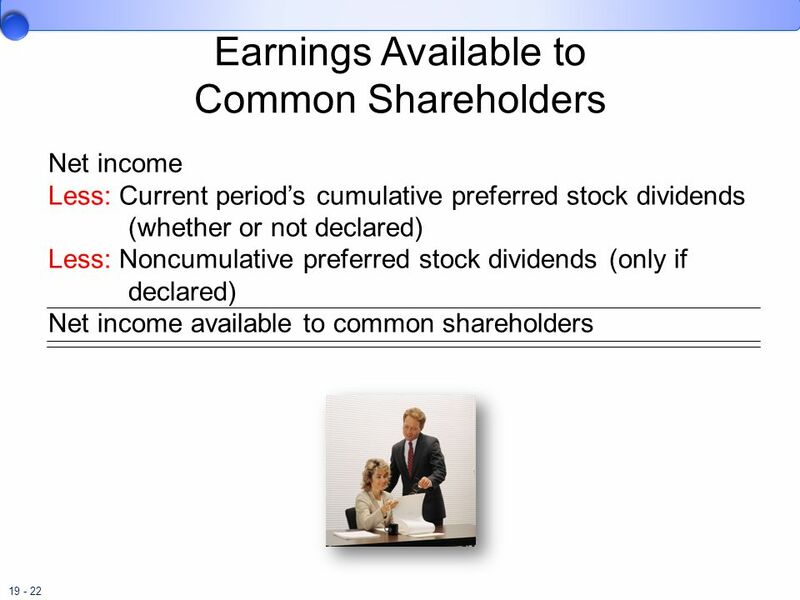 1 Earnings per Share The Introductory Lecture for Acct 414. McGraw-Hill/Irwin Copyright © 2010 by The McGraw-Hill Companies, Inc. All rights reserved. Merchandising Activities Chapter 6. Copyright © 2007 Prentice-Hall. All rights reserved 1 Long-Term Liabilities Chapter 15.